At the moment, we can only accept checks, no credit cards. Please make check payable to: L'Ecole de Danse. Full payment for the entire academic year is due on the first day of class: for the 2016-2017 academic year, tuition is due the first class of the week of September 6th. If your child takes more than one class per week, payments are due on the first class of the week indicated below. 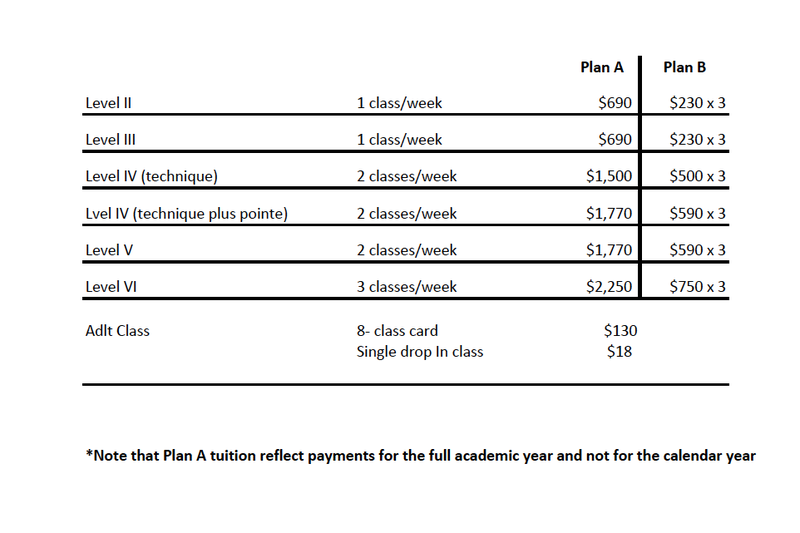 Note that tuition is not based on calendar months but on the full year. Tuition must be paid in full (according to payment plan) on the due date. Please make check payable to: L'Ecole de Danse. An additional 15% will be added on all late payments; $20.00 charge for all returned checks. Classes missed due to illness may be made up within one month. L’École de Danse Ballet School admits students of any race, color, national and ethnic origin to all the rights, privileges, programs, and activities generally accorded or made available to students at the school. It does not discriminate on the basis of race, color, national and ethnic origin in the administration of its educational policies, admissions policies, scholarship and loan programs, and all other school-administered program. If you would like to make a donation, please call 650-365-4596.